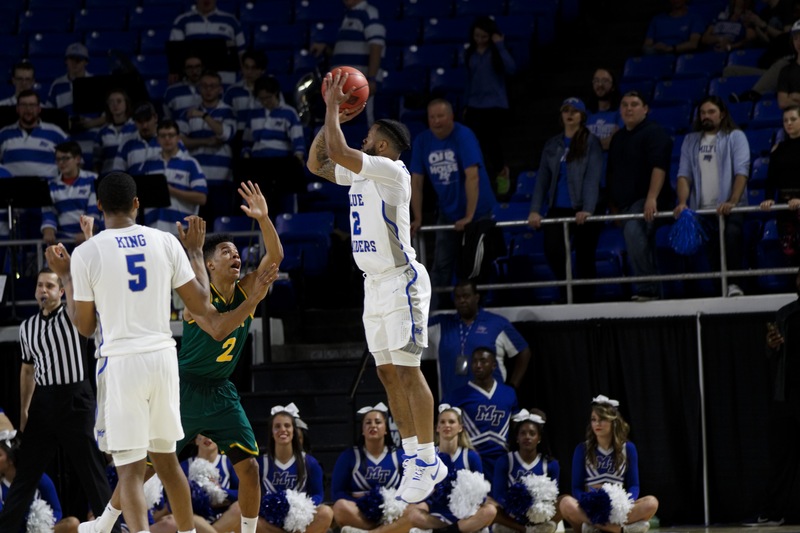 After losing to the Southern Mississippi Golden Eagles in the Conference USA Tournament and failing to earn an at-large bid into the NCAA Tournament, the Middle Tennessee Blue Raiders (25-7) opened up play in the National Invitation Tournament with a dominant 91-64 win over the Vermont Catamounts (27-8). 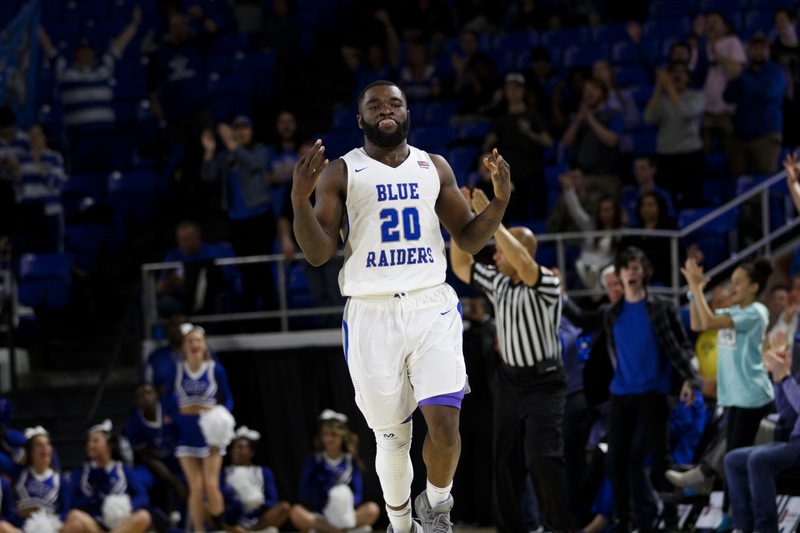 The win was a milestone, as it was the 100th win for seniors Giddy Potts and Ed Simpson, a record for Middle Tennessee. 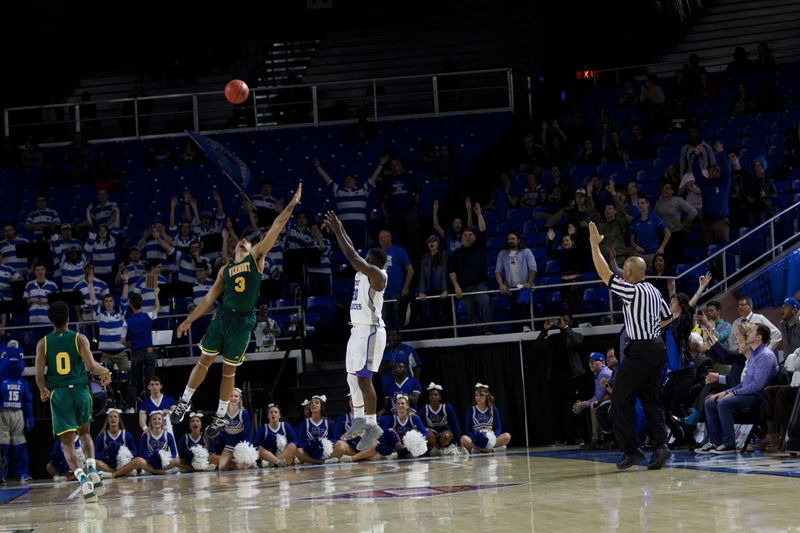 The Blue Raiders opened the game with much better ball movement compared to the Southern Miss game. MTSU scored the first five points of the game, and held a 12-5 lead with 5:29 left in the first quarter. During that stretch, Potts and fellow senior Nick King each knocked down a three to get the crowd rocking. The Catamounts were not to be outdone however, as they used excellent ball movement of their own to end the quarter on a 6-0 run to take a 21-16 lead into the second frame. This is where Potts took over, as he knocked down three more threes and scored 11 of his 16 points to lead the Blue Raiders to their largest lead of the first half at 41-31. 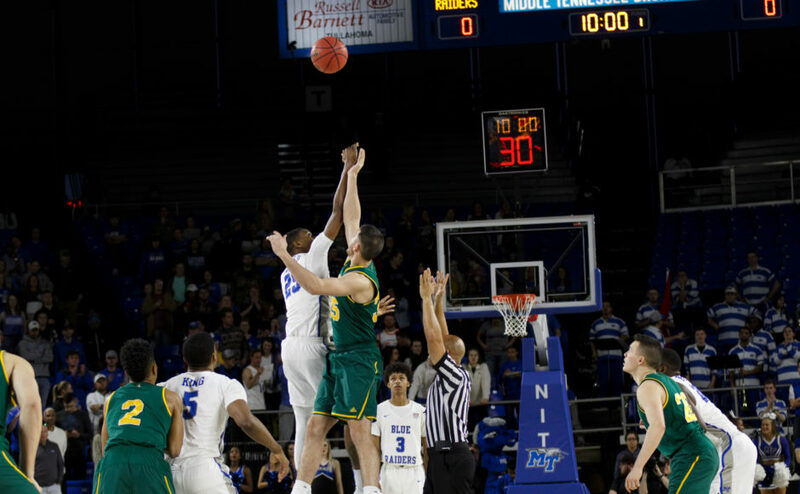 Anthony Lamb kept the visitors in the game however, as his 14 first-half points managed to prevent Middle Tennessee from enlarging the lead much further. American East Player of the Year Award winner Trae Bell-Haynes was a great distributor in the first half, dishing out five assists. He also accrued five turnovers though, and he only managed two points against the MTSU defense. 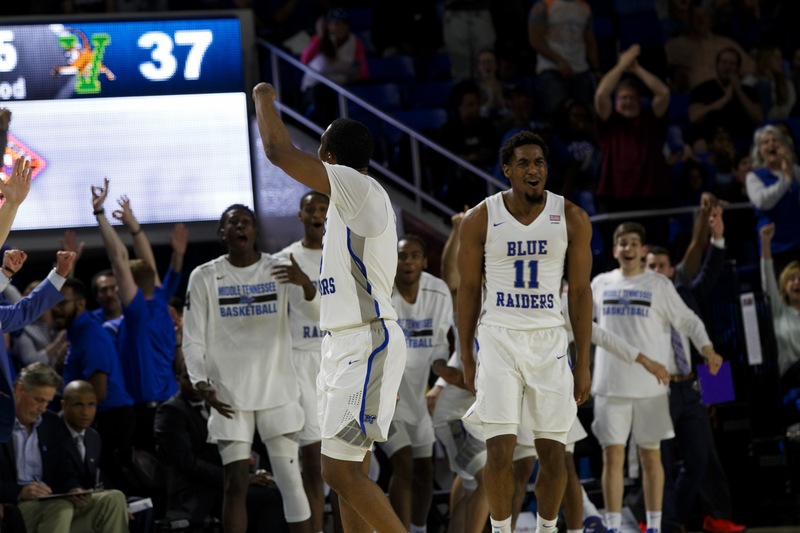 When the halftime buzzer sounded, the Blue Raiders strolled into the locker room with a 41-33 lead. Junior Antwain Johnson added 10 points of his own to Potts’ team-leading 16 to help the home team. The third quarter is where the game really unravelled for the Catamounts. Middle Tennessee used an 18-0 run to give the Blue Raiders a 69-37 lead with 2:56 to go in the period. Freshman Donovan Sims used two circus lay-ups to help amp up the crowd and his five assists led to beautiful ball movement on the offensive end. In the fourth quarter, Vermont cut the lead down to 21, but got no closer. 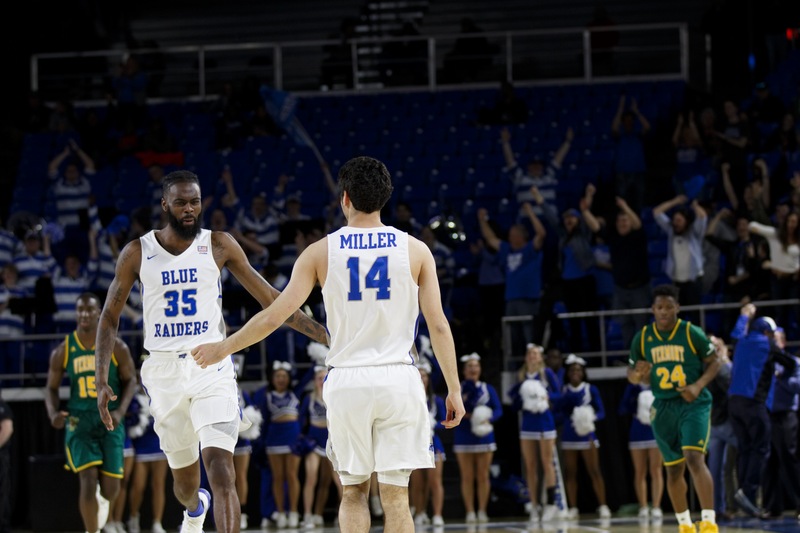 When all was said and done, Chase Miller‘s second three of the season propelled the game to it’s final score at 91-64 in favor of Middle Tennessee. 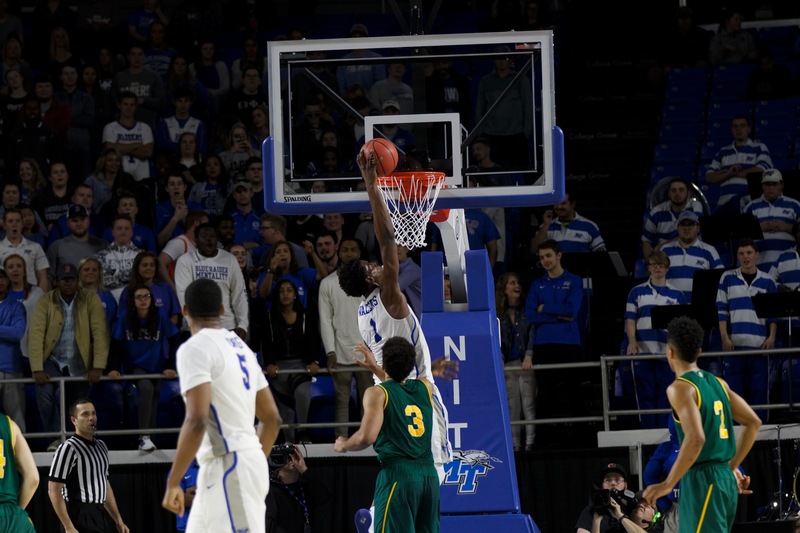 Against the Golden Eagles, Middle Tennessee looked relatively stagnant on the offensive end of the floor. 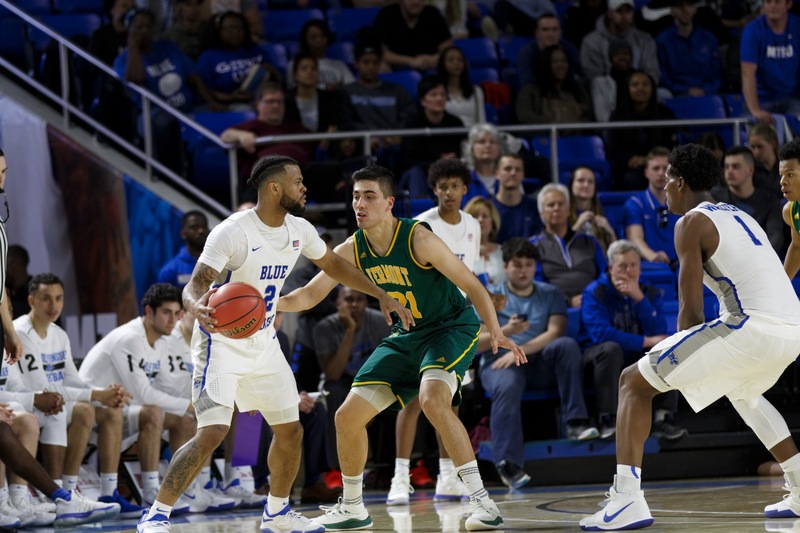 That was not an issue on Tuesday night, as the Blue Raiders recorded 19 assists and shot 64.3 percent from the floor. Potts was the star of the night, as he scored 25 points on 6-11 shooting from beyond the arc. King added a double-double, his 11th of the season, of 16 points and 11 rebounds, while senior Brandon Walters finished with 15. Johnson rounded out the quartet of Blue Raiders in double figures with 14 points. 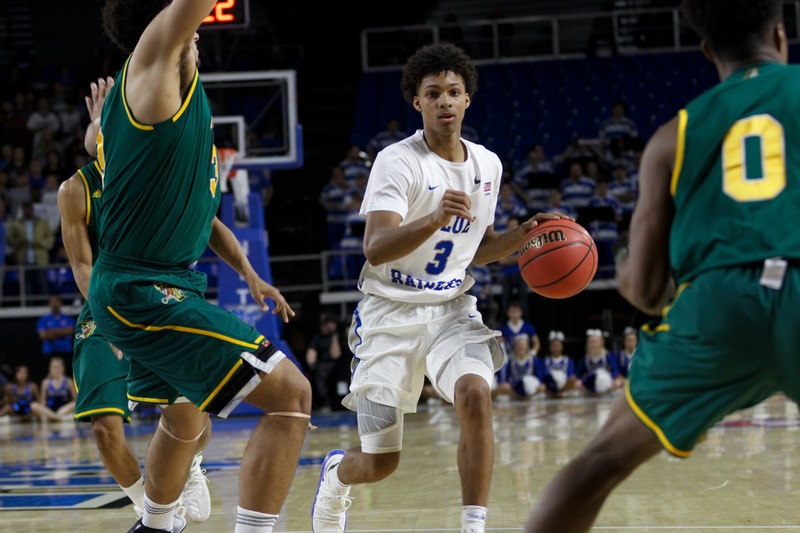 The motivation to halt their two-game losing streak mixed with playing their game led to the Blue Raiders’ improved ball movement. If they continue playing at this level, they be primed for a big run in the NIT. The Murfreesboro native scored six points and collected a team-high five assists in the winning effort. The excellent play on a big stage is nothing new for Sims, as he has played major minutes this season against quality opponents such as Western Kentucky and Vanderbilt. While he may only be an 18-year-old college freshman, his older teammates are more impressed than he is about his play this early in his career. His head coach has been just as impressed with the way he facilitates the offense. 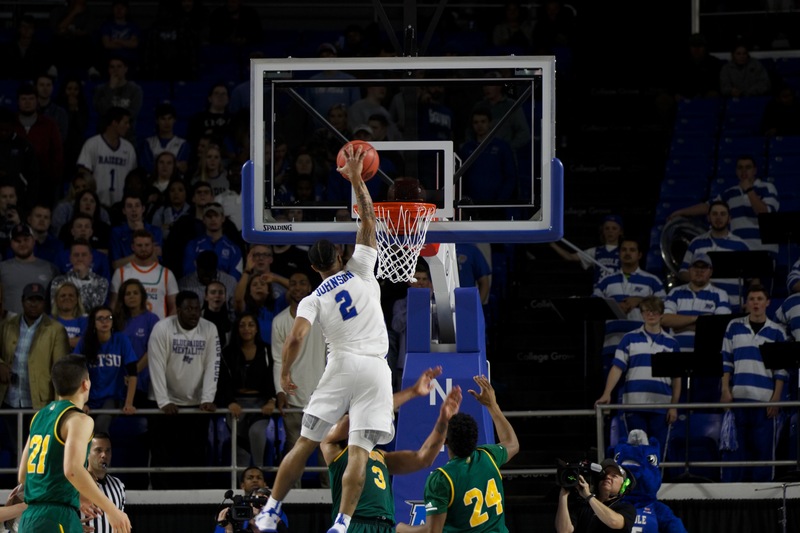 While Middle Tennessee put together a great performance against Vermont, the win left one question in many mind: should this team have been in the NCAA Tournament? The players didn’t let it bother them at all, as they used a dominant third quarter to run the score up to over 30 points and put the game away early. After the game, King believed that they used this performance to send a message for mid-major teams on the bubble. 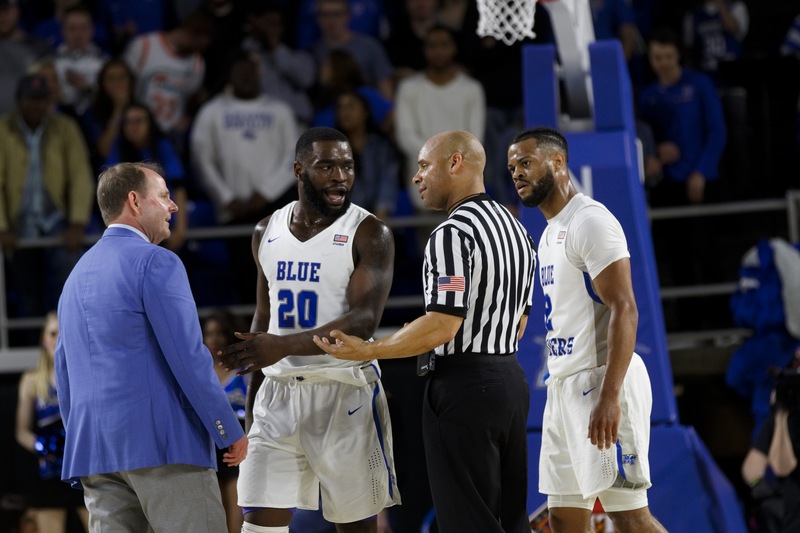 The Blue Raiders will travel to Louisville, Kentucky to take on the Louisville Cardinals in the Second Round of the NIT. The date and time of the game is yet to be announced, as there are more opening games to be played on Wednesday. 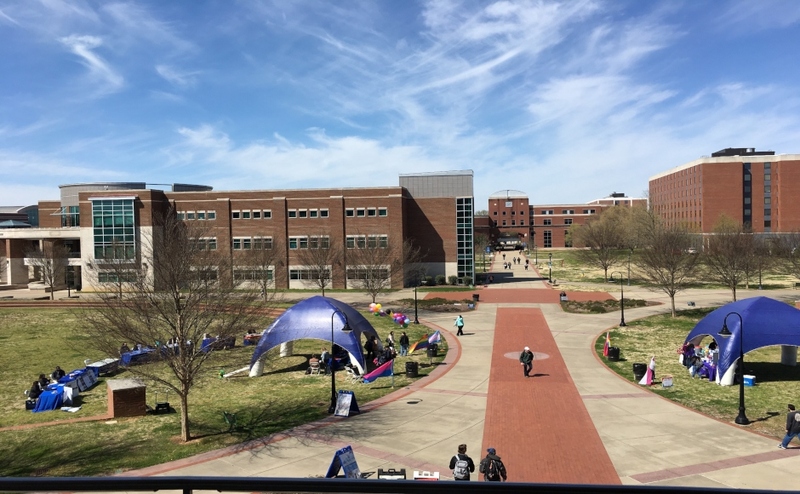 This past season, Middle Tennessee State University had a dream season. They finished 24 and seven and were first in their conference. 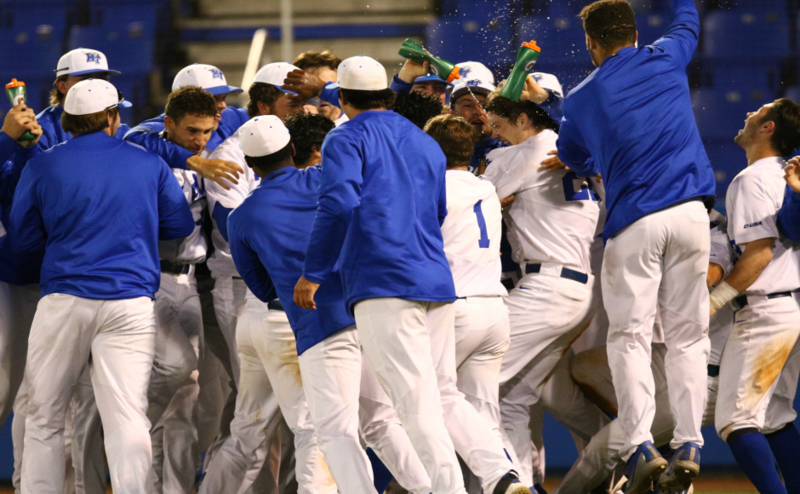 They were ranked nationally for the first time in school history, ranking as high as 24th overall. Although they had a Cinderella season, they missed out on the NCAA tournament for the first time since the 2014-2015 season. It was a tough pill to swallow as they felt, as does many others, were snubbed. They had played the basketball that they ever played only for them to miss out on the big tournament where they were highly liked. 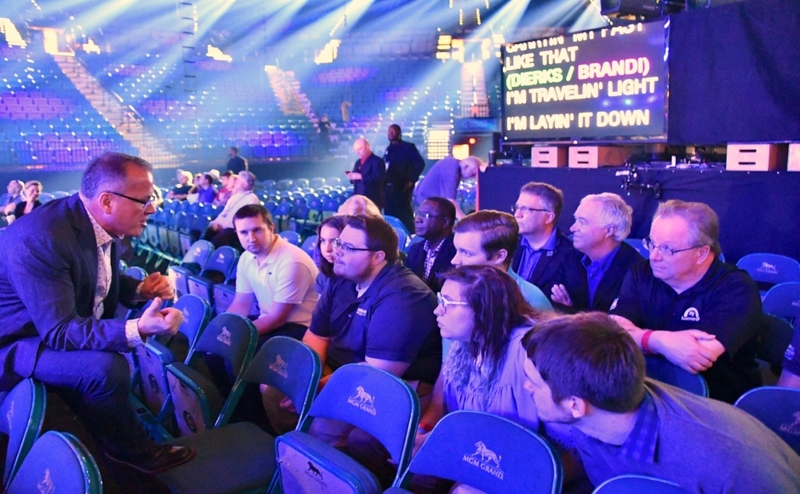 Although they will have to sit the NCAA tournament out, they are now participating in the NIT tournament, where they’ll play the second round versus Louisville on Sunday. For the remainder of their season, their coach, Kermit Davis, will stick around. Coach Davis is down to his last finals games as the MTSU Blue Raiders basketball coach. He recently took a head coaching job over at Ole Miss. Coach Davis was MTSU’s most winningest basketball coach in team history. Since 2002, he achieved a successful 332-187 record. As you can imagine, there was plenty of sadness, but everyone at MTSU congratulated him and wished him the best of luck. I too, would like to wish him the best of luck. 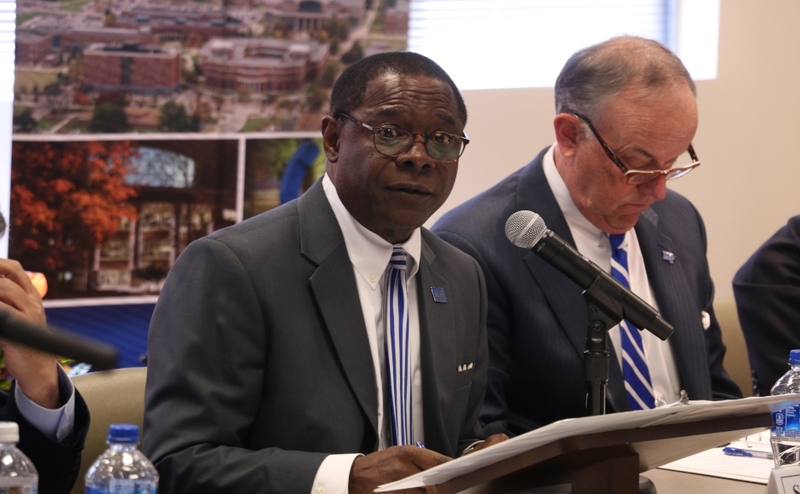 He has do so much for the MTSU basketball program and will definitely make Ole Miss better. Good luck Coach Kermit and good luck MTSU as you continue on.